Guaranteed freight and predictable home time. It's the best trucking decision you'll ever make. Powered by today's best technology, we give our customers a transparent view of freight while offering one on one contact. R.E. Garrison Trucking offers services including dry van, temperature controlled and flatbed transportation. and work directly with the customer. Outsourcing is a great way to ensure expectations are met and also managed. Our solutions are designed with you in mind. R.E. 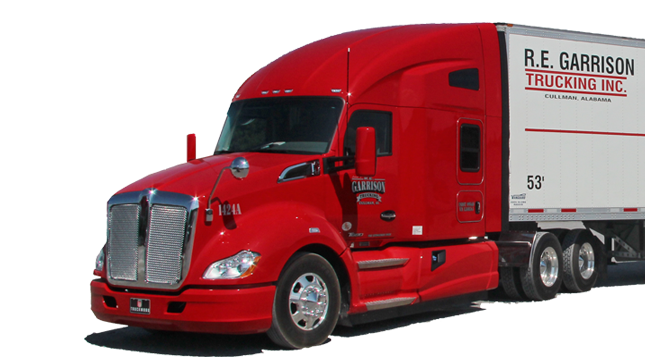 Garrison Trucking is one of the most dependable, on-time and professional companies on the road. When a customer entrusts their product with us, we owe them clean, well maintained equipment manned by courteous, commercial driving personnel. We are determined to bring you the highest standards of quality in all of your carrier needs. It's the best trucking decision you'll ever make. Eternal impact on this world. Garrison is honored to be partners in transportation with some of the best names in the business. We’ll deliver service and solutions for all of your freight requests.